I've a couple of treats for you all this morning! 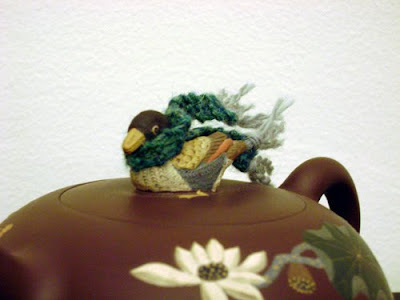 Firstly, my effort to clothe Ducky Teapot has been successful: I think he likes it. I have no idea why I'd never thought to knit for him before! And in honour of the rapidly approaching holidays (eek,) both the Heirloom socks and Domovina socks will be available as FREE Ravelry downloads starting now and running until Sunday, 15 November 2009 at 7 pm EST. You recall the Domovina socks, yes? And, of course, the Heirloom socks that are available in both men's and women's sizes: Grab them while you can! 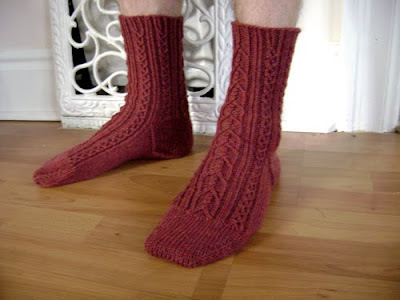 I'm off to knit more socks. November 10, 2009 at 9:53 a.m. He's cute, it looks he's soaring in the wind. November 10, 2009 at 1:19 p.m.
Wow!What fantastic works here on you blog. Your knitting ist fantastic, fabolous and I do not find more superlative words (beacause of my bad english, of course.). If I´m allowed to, I´ll follow your blog and your works now. November 10, 2009 at 2:45 p.m.
You are most creative and most generous!! 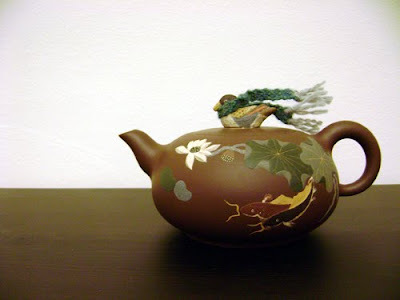 I do enjoy your blog AND your patterns!! November 10, 2009 at 7:40 p.m. The scarf looks perfect on Ducky. Thank you so much for the patterns. November 10, 2009 at 7:51 p.m. The little guy looks so snug and warm in his scarf! 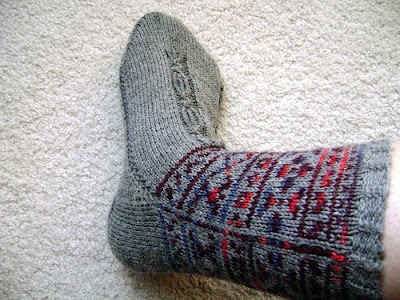 Great sock patterns, too. Many thanks. November 10, 2009 at 10:16 p.m.